Hi, everyone! Today, Christy and the Tiddly Inks design team have a wonderful surprise to share with you! We are having a not-so-secret [now] blog hop aka digital baby shower for our fellow Tiddly Inker, Melissa, because Baby Brennan is due any day now! Melissa has been on the Tiddly Inks team since close to the beginning and although she has had to take some time off to deliver Brennan, we want her to know she is missed and that we are excited Brennan will be here soon. Please join us in celebrating this happy occasion by hopping along... or even better, by linking your own card to say hi to Melissa. My card is show below but if you want to see more delightful cards, all the details for the blog hop can be found on the Tiddly Inks Challenge Blog and there is a LINKY tool for you to add your card there as well. We kept this blog hop simple... all the links will open in a new window from Christy's blog. You definitely want to join in on the fun and festivities because there will be one prize drawn for a random commenter on the main page and another winner selected from all of the cards that are linked up. So, what are you waiting for??? Let's hop to it!! 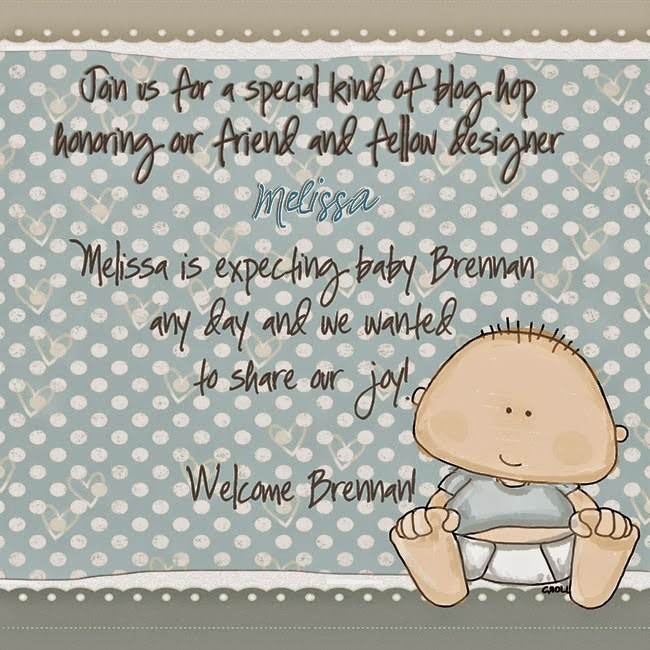 Here is my card for Melissa and Baby Brennan using Little Bear. He's absolutely adorable, but I'm sure Baby Brennan will steal our hearts as soon as he makes his debut!! So... I hope you enjoy hopping along with us today... and don't forget to leave a comment on the main page for your chance to win an awesome prize!! We also encourage you to join us in this baby shower for Melissa -- so LINK UP your cards too for another chance to win!!! And for Melissa... I hope these last few days fly by for you. We can't wait to hear the good news that Baby Brennan has arrived! Lots of design team love and good wishes are coming your way!! Adorable is right! I love the paper piecing and the colours. Wonderful card! Such a sweet card and I love the fabulous boy colors! Oh my I love that cute little paper pieced bear costume! Too adorable! I love the colors! What a darling little card!